Be still our fangirling hearts. It’s Clary and Jace in the flesh. While filming on Shadowhunters doesn’t begin until Monday, we’re getting a ton of behind-the-scenes looks at the new series. But the latest shot from executive producer McG has our fangirl meter bursting through the roof. 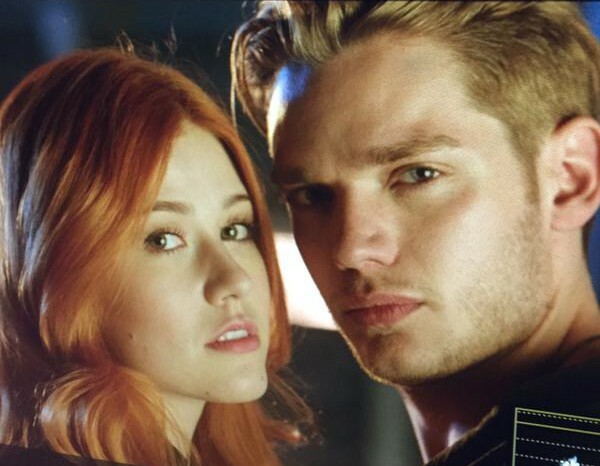 Here’s our first look at Katherine McNamara as Clary and Dominic Sherwood as Jace in Shadowhunters. While it’s not an official still — clearly a photo taken of a photo — it could be from a photoshoot or dress rehearsal. Shadowhunters will premiere on ABC Family in early 2016. OMG! This is so exciting! My my my!! If this shot doesn’t show Clary and Jace, I don’t know what will. All’s that’s missing is some runes! In all his blonde glory! By the angel… This will be the death of me!! McG literally knows what the fans were needing right now. Guys, I think we’re gonna be just fine with him at the helm. I wish they would make Jace’s hair a bit longer. So they aren’t going to give Dominic golden contacts or blond hair then? Well, actually he looks better like this. Well his hair dies look lighter. He had darker hair when they first cast him. I don’t know how he would look super blond though, I kinda like that color on him. Oh my god the Clace in that photo!!! Can’t wait! Tbh, I need to say this. I’m so disappointed with the cast so far. The only one I liked is Matthew. Have you seen the picture of the whole cast? Look at Katherine’s face, she looks so poorly excited, quite fake smile… I don’t like her, she doesn’t have the Clary spirit like Lily Collins did. I don’t think she handle this. And Lily looked younger and more beautiful! Tbh Kat’s face looks weird, at least on this photo. And look at our new Jace. Seriously? That hair makes me wanna cry. Also the stub. I don’t see Jace there, I’m quite missing Jamie Campbell Bower here. I don’t mean to be rude, I just need to express my opinion. I hope you don’t delete my message. We are all entitled to our opinions, you certainly are entitled to yours. I’m sorry that you aren’t immediately pleased with the cast. Hopefully they can change your mind. Ironically my feelings about the movie cast were very similar to your feelings about the TV cast. I personally think that Lily looks much older than Kat. I think that Kat looks very much like the Clary that I imagined. I hated the way that Jamie looked as Jace. I think he did an okay portrayal with what he was given, but his look was not good for me. I’m SO excited about this cast. I think they LOOK great. Clary is tiny like she should be and has the carroty hair. Jace is more masculine looking, and I think his hair is quite blonde enough. I think that Simon is adorkable, as he should be. Alec is really perfect. And so on. I hope they can win your love the way the movie cast was unable to win mine. I hope so, too! I guess each of us has its own visualization of the characters. Maybe some people imagined them this way, and some others like me, visualized them closer to the movie cast. It’s okay, I’ll give this cast a chance, indeed, to see if they pull off at least in the acting part. And I don’t lose hope that this may be not the definitive look for Jace *crossing fingers*. I see everyone so excited with the cast so it’s a good signal, the recognition of the fandom is very important. I may be wrong. But as I said is a matter of perception and imagination, so I guess no one is wrong regarding this kind of topics. Of course everyone is entitled to their own opinion but don’t you think it’s a little premature to be judging anyone in the cast? We haven’t seen them act at all as their characters. This just reminds me of all the hate the movie cast suffered (especially JCB) for things other than acting ability. My two cents, at least give these new actors a chance or else you’re setting yourself up to hate it just on preconceived ideas. Wait until you see them in the show to pass judgement. Also Lily is 26 and Kat is 19, just realistically speaking Kat is closer to Clary’s actual age by a long shot. I am just judging their appearance, not their acting skills, of course. But as I told Amber, the thing is that everyone has a Jace or a Clary in mind that each of us visualized while reading the books. Mine was closer to Jamie. Clary was closer to Lily, imo. Not the hair though, I like Katherine’s hair better. And I’m missing the freckles! But I understand it’s impossible to follow all the details. But some other details are possible… Like give Jace a longer and lighter hair… Wouldn’t you like that? If it looked like Jamie’s hair I would be so happy! Haha I hope it’s not too much to ask. Speaking of that, I always imagined Clary like Jenny Martinez. She’s not know at all anyway. You are entitled to your opinion and that’s ok. We got a picture of how the actors looked like in the movie and it’s ok to miss them. Is hard to picture others when you loved the original cast. I hope you actually get exited once you see them act. I do think kat is a better clary cause she does look younger and jace does look more masculine as stated in other comments. I agree, I’m rather disappointed by the cast so far. Other than Harry, who looks the part quite well, but everyone else is pretty much a disappointment. If anyone agrees with me, the photo of Clace, jace looks way to sullen/serious. Why does everyone do that. He’s a fun kid who is troubled, but doesnt let anyone see. I dont like this att all. The first Movie came about two years ago and now they changed that to tv series. It’s no sense att all.